"Nothing serves liberalism better than a severe contest between intelligence, which presses forward, and an unworthy, timid ignorance obstructing our progress." The Kansas Legislature finish up their turnaround break and have resumed their work in the capitol. It's a good thing, since they haven't done a whole lot in the first 36 days of the session. So far, they still haven't passed a school funding bill or passed Medicaid Expansion. With the mid-April deadline set by the Supreme Court looming, the Kansas legislature has yet to complete its job concerned with school funding. Attorney General, Derek Schmidt has indicated that he needs a decision on school funding by March 15th so he would have time to prepare court briefs. Some lawmakers and community leaders are showing frustration, but today is March 13 and so far - no votes! Some of the litigants in the court case have expressed concern about the level of spending proposed and this has prompted Senator Wagle to threaten to take the case to the U.S. Supreme Court. And, to top it all off we now have a good-ole voucher bill to distract us from getting the real work of funding public education done. Man, it just shouldn't be this hard to prioritize (and pay for) what we value in Kansas. Today, the House Appropriations Committee debated the Medicaid Expansion bill, but the bill failed to pass out of committee when the committee chair, Rep Waymaster (R) voted NO to break the 11 to 11 tie. So, the bill won't get a debate on the House floor unless something creative happens. This is in spite of clear evidence that Medicaid expansion could help us save rural community hospitals. Healthcare is a critical need for all Kansans. And for too many, it's still inaccessible and unaffordable. Rural communities cannot survive without hospitals and affordable healthcare. Period. By expanding KanCare (our version of Medicaid), we can help our hospitals and clinics stay open and provide affordable health care to 150,000 more Kansans, regardless of where they live. To date, Kansans have relinquished over $3 BILLION Federal tax dollars (our Federal tax dollars) due to our failure to expand Medicaid. Over 77% of Kansans believe that expanding Medicaid is right for our state. In spite of this, there are certain Kansas Legislators who will not even consider discussing Medicaid expansion. This is especially troubling with the news this week of yet another hospital closing in Horton, KS. Horton Community Hospital is the city's only healthcare provider. They shuttered their doors because, like Oswego Community Hospital which closed their doors in February, they consistently couldn't pay wages . This is the third rural hospital in Kansas to close this year! As noted in the article, " Rep. John Eplee, an Atchison Republican, met recently with hospital administrators in three communities near his district — including Horton — to determine what it would take to keep their doors open. He said administrators at all three — Horton, Winchester and Hiawatha — said that passing Democratic Gov. Laura Kelly’s Medicaid expansion proposal would provide needed infusions of cash." Governor Kelly's Budget is clearly explained here , by Davis Hammet of Loud Light. The Kansas Legislature did pass legislation relating to the Kansas Public Employees Retirement fund (KPERS). In February, lawmakers rejected the Governor's plan to reamortize the fund in an attempt to get the fund on a more sustainable path. During the Brownback years, KPERS payments were "delayed, tweaked or eliminated 15 times." In my mind, the re-amortization plan was to be used in the same way a home remortgage plan would be used after a family repeatedly makes bad decisions about their spending and then falls behind in their house payments. With the threat of foreclosure, they turn to all available tools to help them save their home and get back on track - they refinance their mortgage. While it does cost the homeowners more in the long run, it allows them to stabilize their finances while they get back on their feet. After 8 years of the disastrous Brownback policies this proposal would do the exact same thing. It's hard to dig your way out of 8 years of bad policy without using every possible resource and the KPERS fund is a resource. Is it ideal? No. Would it be better if the people in the Brownback administration hadn't wrecked our state to begin with? Yes. Can we find another way to get us out of this self-inflicted problem? We'll see. One week later, lawmakers unanimously passed legislation that would repay $115 million to the KPERS fund. Yes, after 8 years of delaying, tweaking, or eliminating payments to KPERS now ALL legislators have seen the light and want to repay KPERS. The irony is just too much. Not that I'm against finally paying KPERS. It just makes you wonder how so many who voted to "delay, tweak, and eliminate" all those years have finally seen the light. The Senate passed a tax bill back in February in spite of warnings that it would blow up the Governor's budget and put us right back into the financial turmoil we experienced under the Brownback administration. The House debated the bill last week and it passed in the House by a margin of 76 to 43. Because the bill was amended in the House, the bill goes back to the Senate before a final vote is taken and the bill is sent to the Governor. House Majority Leader, Rep. Dan Hawkins made the argument that not passing the tax bill would be like keeping a "found billfold" and urged others to do the right thing and "give [the money] back" to its rightful owner. Oddly, he's never made the same argument with the $3 BILLION dollars of found money we would get if we expanded Medicaid and brought that money back home. As noted elsewhere, the moral hypocrisy of the GOP "leadership" is stunning, but predictable. Find money that gives health care to the poor, "it's a bad deal!" Find money that helps the rich, "give it back!" Pretty much sums up who they're fighting for here in Kansas. Speaking of Davis Hammet!! It was great catching up with him last week here in Overland Park. If you haven't seen his videos, check them out below. He does a great job of explaining what's going on each week in the Kansas Legislature. Be sure to watch the video for week 5, which explains six (6) controversial bills co-sponsored by far-right GOP legislators. Gov. 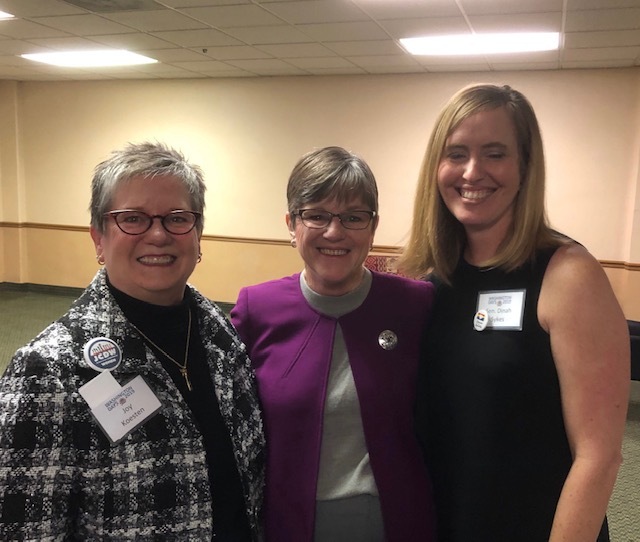 Laura Kelly & Sen.
Democrats from all across Kansas attended Washington Days and I was one of them! It was great seeing so many old friends and making new friends over the course of the two day convention. 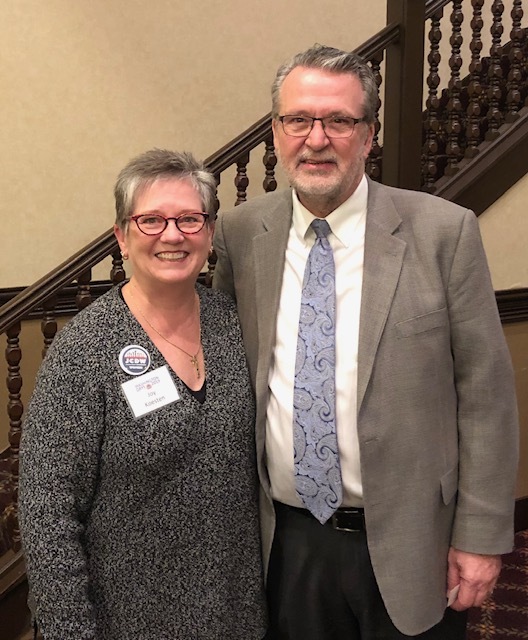 The convention banquet, featuring Senator John Tester (Montana) and Governor Laura Kelly, was sold-out. 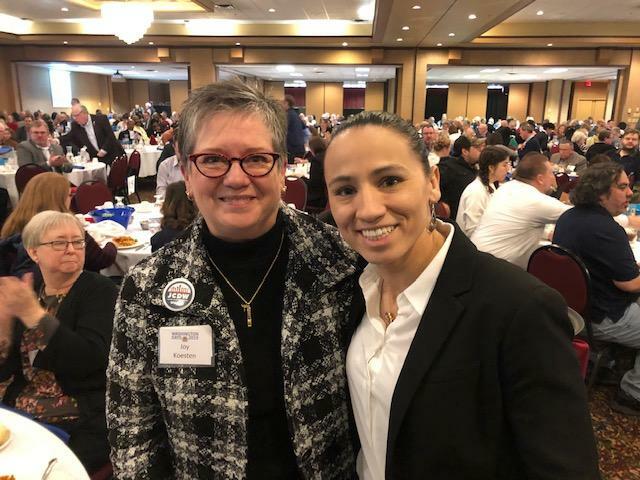 At the luncheon earlier in the day, Congresswoman, Sharice Davids, was the keynote speaker and I had the honor of sitting at her table. Lt. 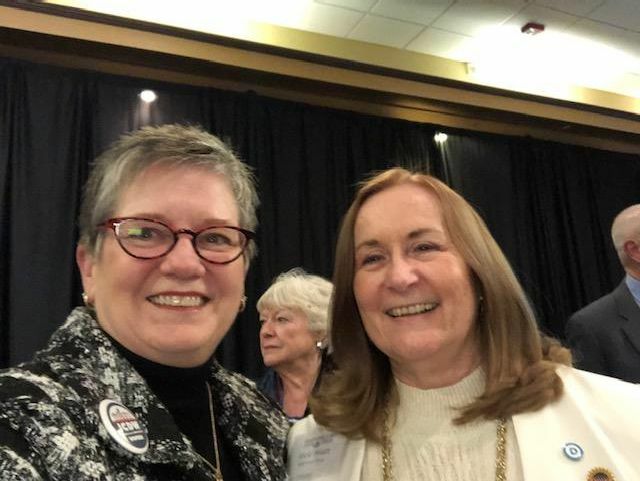 Governor Lynn Rogers (right) introduced Congresswoman Davids, but not before giving Sen. Barbara Bollier, Sen. Dinah Sykes, Rep. Stephanie Clayton and me a warm welcome into the Kansas Democratic Party. It was lovely! 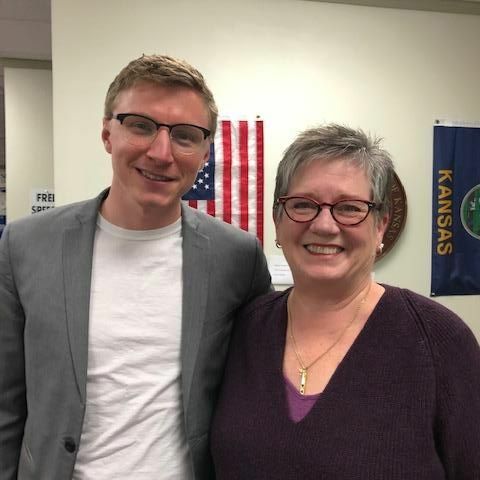 During the convention, the Kansas Democratic Party elected new leadership. If you haven't check out the Democratic Party Platform, you should! We stand for strengthening public education, building strong rural communities, providing access to health care, and welcoming immigrants, just to name a few. There are lots of opportunities to be involved with the Democratic Party and I hope you'll join us! Sign up to receive the JoCo Dems newsletter or explore the calendar for ways to get involved. 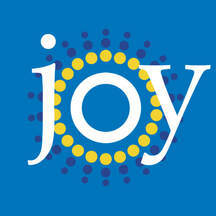 Look for the JoCo Dems Facebook page too, for the latest information about upcoming events! These are just a few of the many grassroots organizations that keep an eye on legislative activities. I hope you'll find many ways to stay informed and engaged.